Todays outfit is my favorite kind of outfit, simple and comfortable. 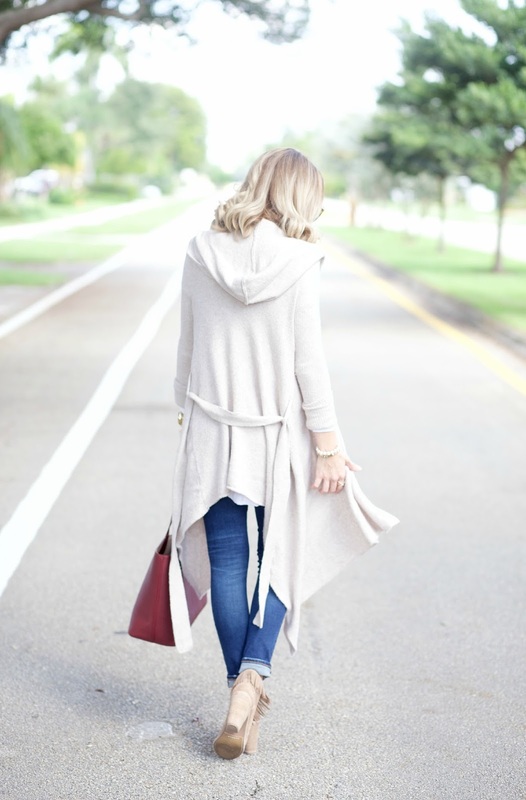 I love this cardigan and this t- shirt is such a great everyday staple. I am wearing a extra small and it is pretty long, which I love because I can wear it with leggings. For $18 I might need it in every color. I definitely agree, simple and comfortable outfits are the best! I loved how you used that bag for a pop of color! Love these light colors on you. Love your tote! Such a gorgeous and perfect fall color! Fantastic boots and bag, you're looking so stylish! I need some good sweaters and cardigans and this one looks amazing! Anything Free People makes is perfect. Wow, $18 what a steal! Love this for a casual everyday look! Such an easy yet chic look! Love it! Such a great everyday look! Totally something that I would wear! That's my favorite kind of outfit, too! I love the neutral colors in yours. I could wear something like this every day! Those booties are precious, too:)! That cardigan looks comfy and I love the fridge detailing on the boots!! You look amazing in delicate, light colors. Loving the mix of textures too! Simple and comfy is my kind of outfit too. Love long cardi's! They're the best most versatile piece to own.